San Mames is one of the most difficult ground in La Liga to visit and get a result. This was what happened to defending champion, Real Madrid when they travelled to San Mames as they couldn’t hit the back of the net throughout the 90 minutes. 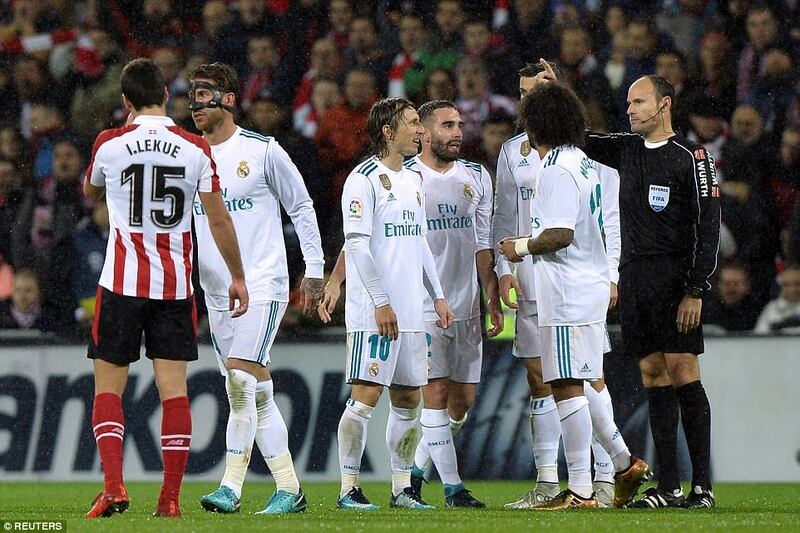 Athletic Bilbao made sure Real had a torid night as they frustrated the Los Blancos to just getting a point in the game. Real Madrid missed the opportunity to reduced the gap between them and table toppers, Barcelona after a disappointing game that also saw Real finish with a man less when Sergio Ramos was sent off. In the first first, it was a closely contested game and saw little opportunities but Karim Benzema still got the opportunity to give Madrid the lead but his shot hit the post early in the game. After the Benzema miss, Real looked a shadow of themselves and struggle to create more chances. Zinedine Zidane’s side looking devoid of ideas on a cold night in the Basque Country. The first half ended with little to show for it and both sides went for the break hoping to get something after they return. The second half was not that different from the first in terms of chances created. Despite the fact that Real were missing Bale and Asensio who were out, they still had the power to see off Bilbao but their form lately have been nothing to write home about. Ronaldo got a chance to put them on top in the second half when his shot hit the woodwork. The Portuguese was unfortunate not to have hit the back of the net. Barca by eight points, whilst Athletic move up to 15th.